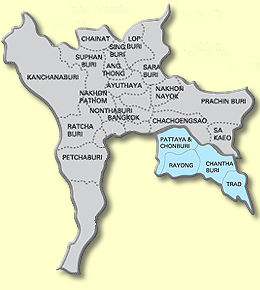 Central Thailand, also known as the Central Plains, is an endless flat terrain dominated by the giant urban agglomeration of Bangkok. The vast majority of visitors to the Kingdom arrive via the capital city, and are immediately thrown into the wondrous chaos that the metropolis is renowned for. The city caters for all tastes. It's a shopaholic's delight with the famous floating markets such as Damnoen Saduak. For those with a sense of culture, a visit to the Kings Palace is a must and for the nighttime thrill seeker, a visit to Soi Cowboy is almost obligatory. The Summer Palace at Bang Pa In makes for an interesting break if heading north to the ancient city of Ayutthaya. This was Siam's capital for over 400 years and is home to an impressive list of temples and ruins. However the city is more than just a reminder of Thailand's past and worth a visit in its own right. Heading west as the terrain becomes more hilly is Kanchanaburi, famous, or perhaps infamous, for the Bridge over the River Kwai. Further south you have the beach resorts including Hua Hin, home to the Kaeng Krachan National Park. In Chonburi on the eastern seaboard is the mostly Thai resort of Bang Saen, the sin city of Pattaya with the most outrageous nightlife to be found in all of Thailand. A little further down the coast is the unspoilt village and beach of Bang Saray.